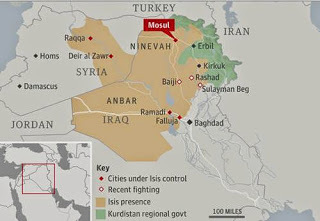 June 13, 2014 (Tony Cartalucci - LD) - Heavily armed, well funded, and organized as a professional, standing army, the forces of the Islamic State of Iraq and Syria (ISIS) swept southward into Iraq from Turkey and northeastern Syria, taking the cities of Mosul and Tikrit, and now threaten the Iraqi capital city of Baghdad itself. The United States was sure to prop up two unfounded narratives - the first being that US intelligence agencies, despite assets in Iraq and above it in the form of surveillance drones, failed to give warning of the invasion, and that ISIS is some sort of self-sustaining terror organization carving out a "state" by "robbing banks" and collecting "donations" on Twitter. A senior U.S. official said the intelligence collected under the small [secret US drone] program was shared with Iraqi forces, but added: "It's not like it did any good." The rapid territorial gains by the Islamist forces loyal to Islamic State of Iraq and al-Sham, or ISIS, an al Qaeda offshoot, caught the U.S. by surprise, the officials said. Despite drone flights collecting intelligence, and a 3-year ongoing CIA program (here, here, and here) all along the Turkish-Syrian border to "monitor" and "arm" "moderate" militants fighting the Syrian government, the US claims it was caught "by surprise." If drones and CIA operatives operating in ISIS territory weren't enough to detect the impending invasion, perhaps the CIA should have just picked up a newspaper. The question remains, if a Lebanese newspaper knew ISIS was on the move eastward, why didn't the CIA? The obvious answer is the CIA did know, and is simply feigning ignorance at the expense of their reputation to bait its enemies into suspecting the agency of incompetency rather than complicity in the horrific terroristic swath ISIS is now carving through northern Iraq. Described extensively in the full New Eastern Outlook Journal (NEO) report, "NATO’s Terror Hordes in Iraq a Pretext for Syria Invasion," the United States, Turkey, Saudi Arabia, and Qatar, have funded and armed terrorists operating in Syria for the past 3 years to the tune of hundreds of millions of dollars - coincidentally the same amount that ISIS would require to gain primacy among militant groups fighting in Syria and to mobilize forces capable of crossing into Iraq and overwhelming Baghdad's national defenses. Image: The most prominent routes into Syria for foreign fighters is depicted, with the inset graph describing the most widely used routes by foreign fighters on their way to Iraq, as determined by West Point's 2007 Combating Terrorism Center report "Al-Qa'ida's Foreign Fighters in Iraq" (page 20). These same networks were then used to invade and attempt to overthrow the Syrian government itself in 2011, with the addition of a more prominent role for Turkey, and today in 2014, to re-invade Iraq once again. The NEO report includes links to the US Army’s West Point Countering Terrorism Center reports, “Bombers, Bank Accounts and Bleedout: al-Qa’ida’s Road In and Out of Iraq,” and “Al-Qa’ida’s Foreign Fighters in Iraq,” which detail extensively the terror network used to flood Iraq with foreign terrorists, weapons, and cash to fuel an artificial "sectarian war" during the US occupation, and then turned over to flood Syria with terrorists in the West's bid to overthrow the government in Damascus. What's ISIS Doing in Iraq? The NEO report would also post Seymour Hersh's 2007 article, "The Redirection," documenting over the course of 9 pages US, Saudi, and Israeli intentions to create and deploy sectarian extremists region-wide to confront Iran, Syria, and Hezbollah in Lebanon. Hersh would note that these "sectarian extremists" were either tied to Al Qaeda, or Al Qaeda itself. 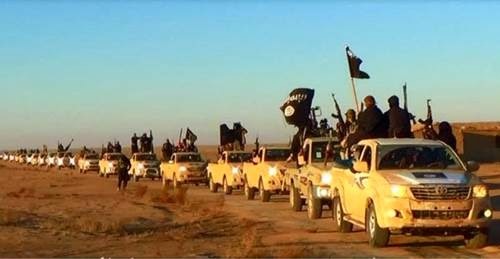 The ISIS army moving toward Baghdad is the final manifestation of this conspiracy, a standing army operating with impunity, threatening to topple the Syrian government, purge pro-Iranian forces in Iraq, and even threatening Iran itself by building a bridge from Al Qaeda's NATO safe havens in Turkey, across northern Iraq, and up to Iran's borders directly. Labeled "terrorists" by the West, grants the West plausible deniability in its creation, deployment, and across the broad spectrum of atrocities it is now carrying out. It is a defacto re-invasion of Iraq by Western interests - but this time without Western forces directly participating - rather a proxy force the West is desperately attempting to disavow any knowledge of or any connection to. However, no other explanation can account for the size and prowess of ISIS beyond state sponsorship. And since ISIS is the clear benefactor of state sponsorship, the question is, which states are sponsoring it? With Iraq, Syria, and Iran along with Lebanese-based Hezbollah locked in armed struggle with ISIS and other Al Qaeda franchises across the region, the only blocs left are NATO and the GCC (Saudi Arabia and Qatar in particular). 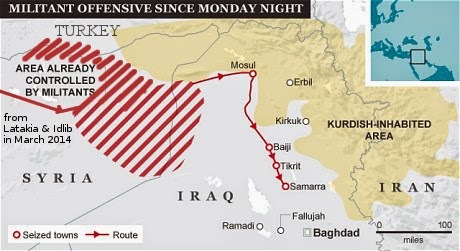 With the West declaring ISIS fully villainous in an attempt to intervene more directly in northern Iraq and eastern Syria, creating a long desired "buffer zone" within which to harbor, arm, and fund an even larger terrorist expeditionary force, Syria, Iraq, Iran, and others are offered an opportunity to preempt Western involvement and to crush the ISIS - cornering and eliminating NATO-GCC's expeditionary force while scoring geopolitical points of vanquishing Washington's latest "villain." Joint Iraq-Iranian operations in the north and south of ISIS's locations, and just along Turkey's borders could envelop and trap ISIS to then be whittled down and destroyed - just as Syria has been doing to NATO's proxy terrorist forces within its own borders. Whatever the regional outcome may be, the fact is the West has re-invaded Iraq, with a force as brutal, if not worse than the "shock and awe" doctrine of 2003. Iraq faces another difficult occupation if it cannot summon a response from within, and among its allies abroad, to counter and crush this threat with utmost expediency.